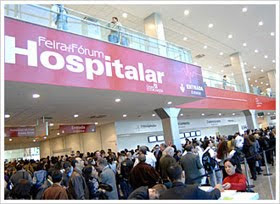 Aerotel Medical Systems will present its innovative personal homecare solutions at the Hospitalar 2010 expo and conference, which will take place in São Paulo, Brazil on May 25-28, 2010. During the show, Aerotel will showcase its e-CliniQ Homecare System for remote monitoring of various health parameters and other eHealth and mHealth solutions. Ofer Atzmon, VP Business Development and Marketing at Aerotel, will present the Heartline ECG Monitoring and GeoSkeepr Personal Safety Device at the Israeli booth at the Green Pavilion N87, which is located at the Expo Center Norte. Hospitalar, which is the largest specialized event in the medical market in Latin America, is an international fair of products, equipment, services and technologies for hospitals, laboratories, pharmacies and clinics. 1,200 exhibitors will present their services and products to some 86,000 professional visitors. Hospitalar is organized in cooperation with MEDICA - World Fair of Medicine and is affiliated to the International Hospital Federation (IHF), the worldwide association of hospitals. Aerotel's products Heartview P12/8, Heartview12L and HRS receiving software are already used and certified in Brazil market and the company has several local clients including ITMS, which provides a service to SAMU, the national ambulance service of São Paulo state. During the show Aerotel will hold a presentation describing the usage of mobile handheld ECG tele-monitoring devices by ambulance services and will present case studies of services in Brazil, Italy and in Russia. Ambulance staffs (paramedics) use the devices to monitor people injured in car accidents or in various emergency situations at home. They can record the ECG trace and transmit it within minutes to a remote medical centre using their mobile phones. The service provides significant benefits, including critical time savings, enhanced level of emergency treatment, expert guidance to the ambulance staff and increased chances for patient recovery form critical situations. Atzmon has presented already opportunities for cooperation in the field of Telemedicine and Home Telehealth, at a special seminar on technological cooperation between Brazil and Israel.